Welcome to the WHSC Junior Sailing Course section, we have a very active junior sailing program for the summer months ahead. If your family is new to sailing, then you’re in the right place. Sailing is an excellent to foster youths confidence and independence in a way no other sport can. Just imagine the feeling a 7 year old has when they take control of ‘their own boat’ for the first time. A WHSC junior course is the perfect safe environment to begin the journey. Note: If you book 3 or more weeks in July you can avail of a 50% discount on August course. Note 2: Participation in an ISA accrediting course does not guarantee your certification – you must be able to demonstrate that you have understood and can complete the relevant skills to achieve certification. Similar to acquiring new skills in any discipline, the more time you spend practicing the better you will become. So we encourage you to gain as much experience and time on the water as you can outside of course time. Take any and every opportunity that comes your way to go sailing, even if it’s not in a boat that you have sailed before – get out there, have fun and enjoy your sailing. 9.30am all other days, and also excepting BOATING BUDDIES and COOL CADETS both begin at 10am and finish at 2pm daily. All courses finish at 4.30pm everyday, except on WEDNESDAYS, when we break at 1pm, and everyone comes back at 5pm for club racing, which finishes about 9pm. Note 4: If you book 3 or more weeks in July you can avail of a 50% discount on August course. 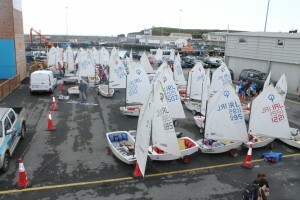 The provision of each course is subject to demand and is at the discretion of the Commodore and the Junior Organiser.